West Marsh, following a mid-summer draw down. Many people have asked, "How can I help?" At present, the best ways individuals can support the mission of Standing Rush are to keep current on our efforts and to voice individual support for Great Lakes funding and projects that aim to protect wetlands in perpetuity. Also, please consider subscribing to this blog, following us on Facebook and Instagram, and inviting friends and family to do the same. This truly is a grassroots effort, so the more who know about it, the more we can get accomplished. More detail will be provided via future posts, but consider reaching out to your political representatives to let them know that you support on-the-ground projects that improve and protect water quality and wildlife habitat. This is particularly critical now, in a political climate where environmental funding in general -- and Great Lakes funding in particular -- is in real jeopardy. BE ADVISED: A receipt should be emailed to you within minutes of submitting an online donation. If you have any difficulty or do not receive a receipt, please contact us at standingrush@gmail.com. A nominal service charge is taken by PayPal to process a donation (e.g. ~4% or $1.03 on a $25.00 donation). If you would prefer to make a donation by check to avoid any processing charges, please contact us. 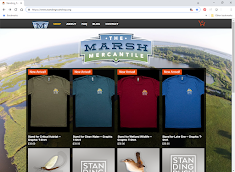 Another very meaningful way you can support the cause is to visit and patronize The Marsh Mercantile -- a new online forum that allows fans of wetlands, conservation, and the outdoors in general to display what they stand for to the world by purchasing and displaying their very own Standing Rush clothing and accessories. Visit now and check back often -- we are working hard to grow our offering!